Wise Disk Cleaner pro is a user friendly, fast and easy to use application developed to free up disk space by deleting junk files that are no longer used by any software on your system. Even the least experienced user can easily remove junk files with this tool.Delete files to the Recycle Bin. A part of Move files to a specified folder, allow you can easy to restore the files. Scan and remove invalid and superfluous junk files. ...... and various log files, index files and backup files. You'd be amazed at how much space these junk files take up. Wise Disk Cleaner pro provides many advanced options. It lets you identify more junk files and old files. And for your safety, you can move these files to a designated folder, allowing you to restore them if needed. * Export entries to MS Excel. Qweas is providing links to Wise Disk Cleaner pro 7.16 as a courtesy, and makes no representations regarding Wise Disk Cleaner pro or any other applications or any information related thereto. Any questions, complaints or claims regarding this application Wise Disk Cleaner pro 7.16 must be directed to the appropriate software vendor. 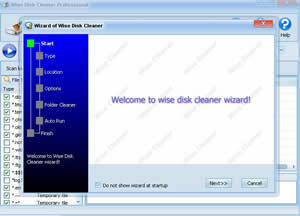 You may click the publisher link of Wise Disk Cleaner pro on the top of this page to get more details about the vendor.